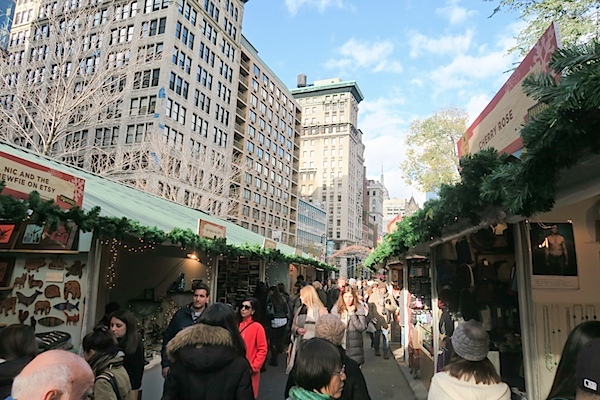 I was in the Flatiron district for yoga a few weeks ago, so I decided to walk down to Union Square to visit the Union Square Holiday Market. 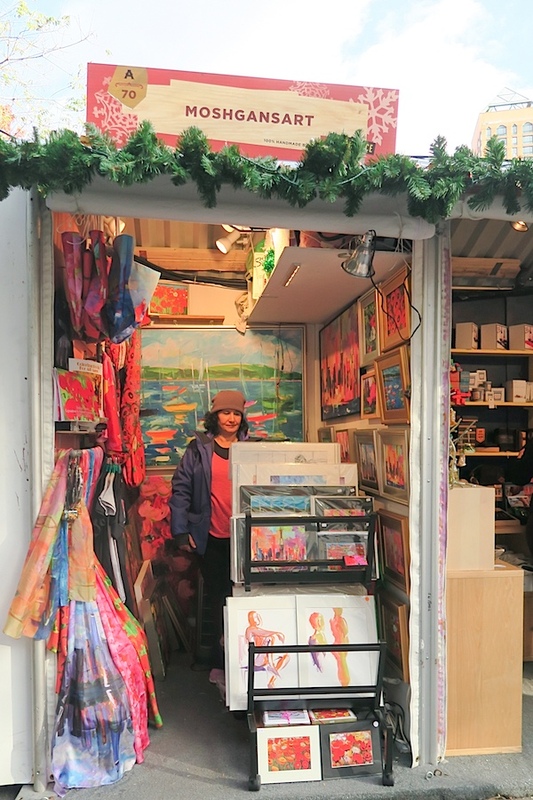 It was a pretty cool little pop-up shop, and I thought you may like to see what it was like. 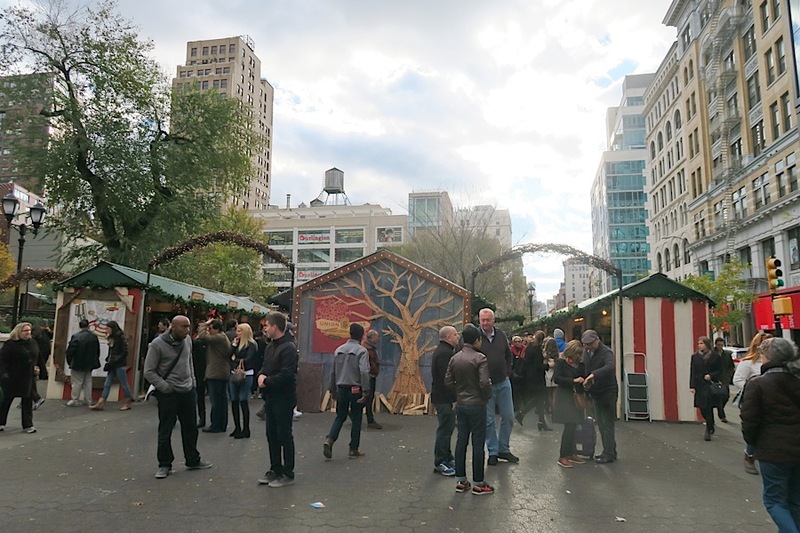 The market opens around mid November and closes on Christmas Eve. 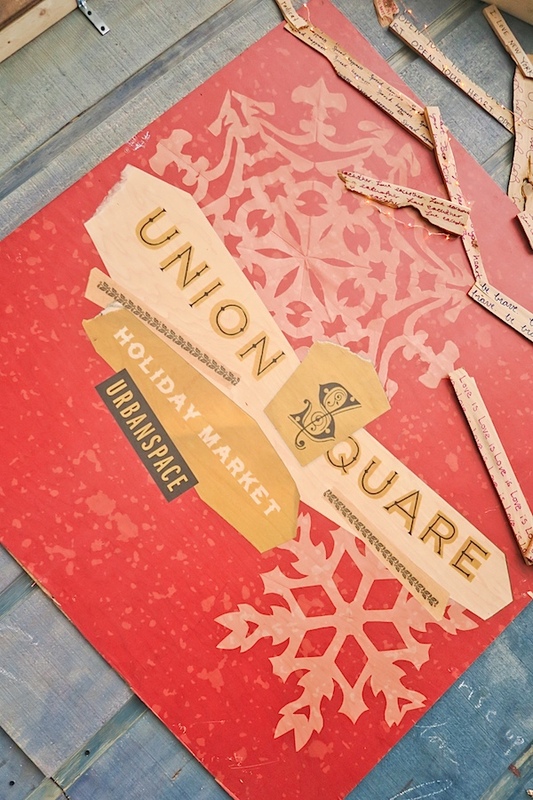 There’s easy access to the market since it’s located in Union Square Park where there’s a popular subway stop, 14th Street – Union Square (4, 5, 6, L, N, Q, R, W). I entered from the northwest side of the market where the shopping is located. There were so many cute booths, but I only shopped at a few. A print of a painting of the NYC skyline caught my eye at the booth of Moshgan’s Art. I actually wandered around the market a bit longer before returning to take a closer look. It’s a colorful rendition of the skyline, and I had to have it. I’ll share photos of it later, if you’d like. You can sort of see one print in the photo above – the front left one on the top level of the stand. It’s so pretty! 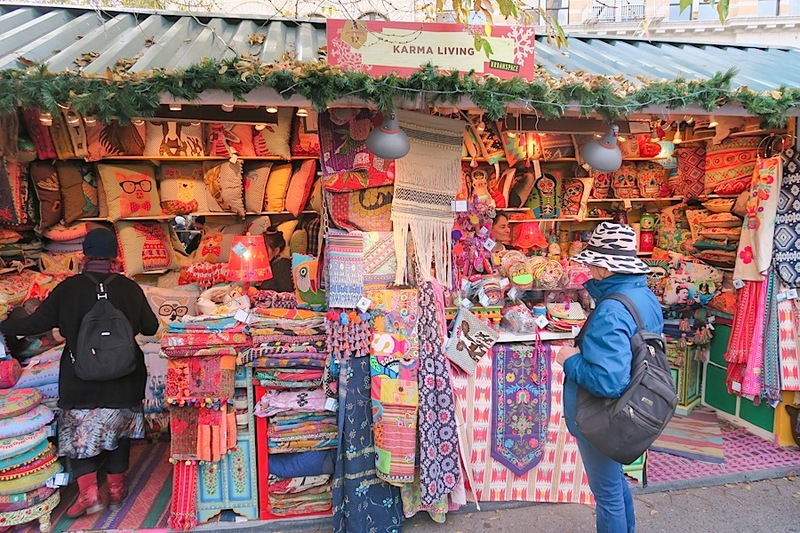 I also loved the colorful booth of Karma Living. 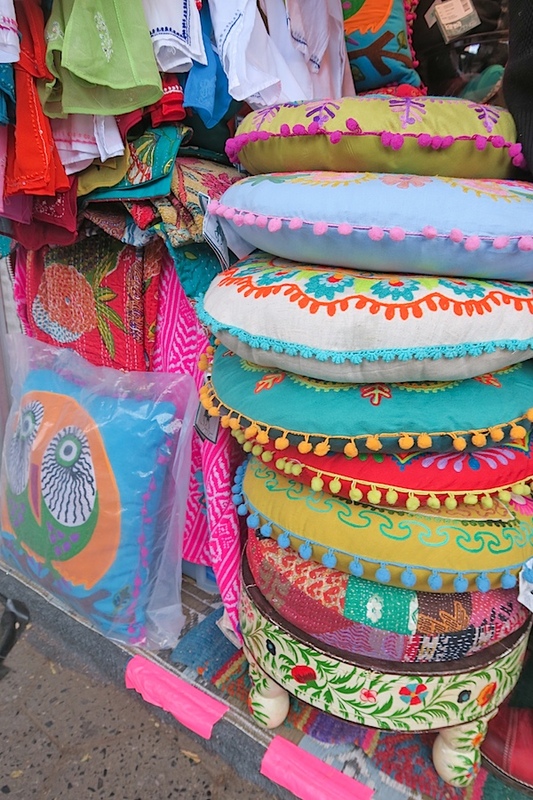 I got one of these colorful round pillows to use as a meditation pillow. I didn’t realize at first that the Union Square Holiday Market would have food too. 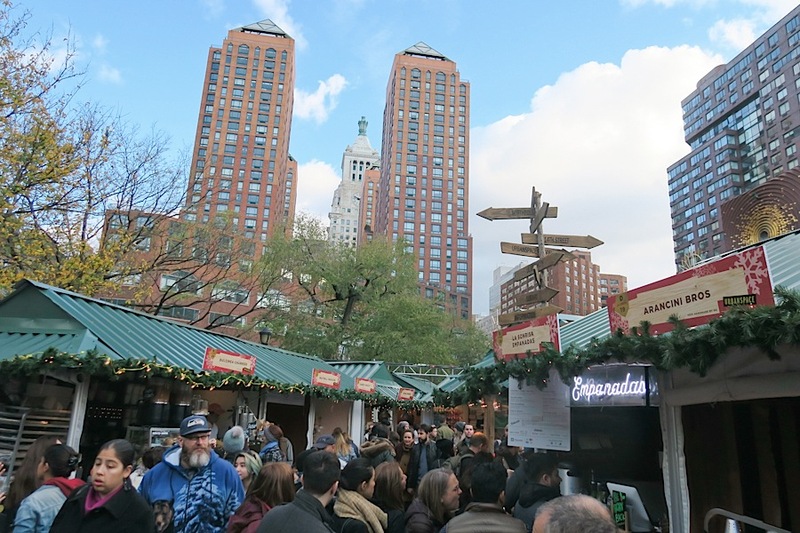 But, while I was shopping at the opposite end from where I’d entered, I smelled the familiar smell of…funnel cakes. 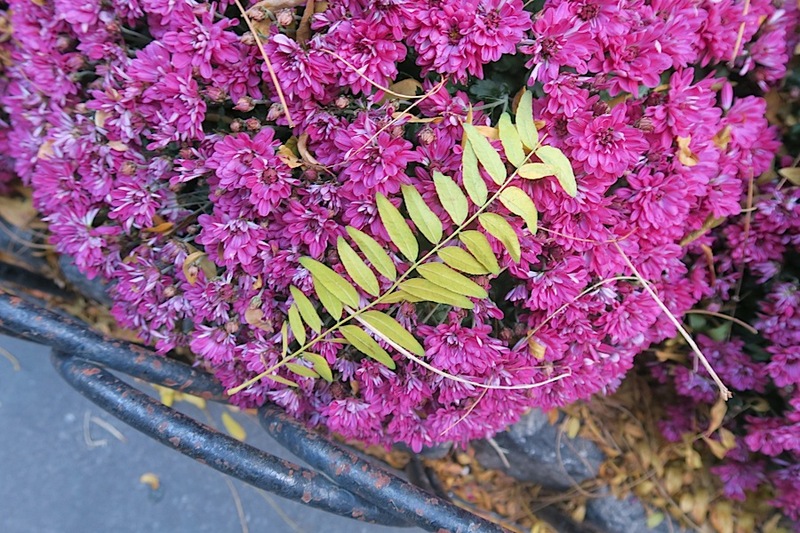 Or something that smelled just like them. I think it may have actually been Doughnuttery doughnuts (which I’ve had before!) 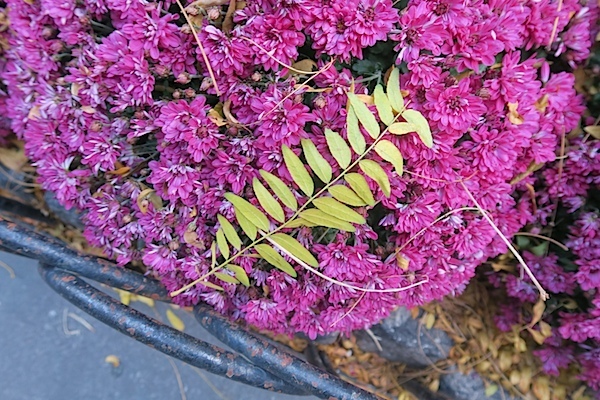 that I smelled. I followed the delicious scent around the corner and saw there were quite a few food vendors at the market. 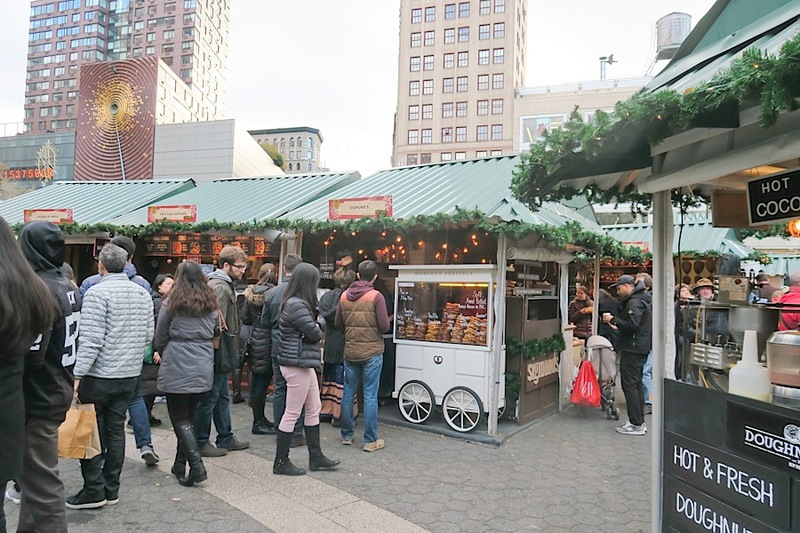 Of special note due to the cold weather, I quickly saw plenty of hot chocolate and hot apple cider options. Yes! 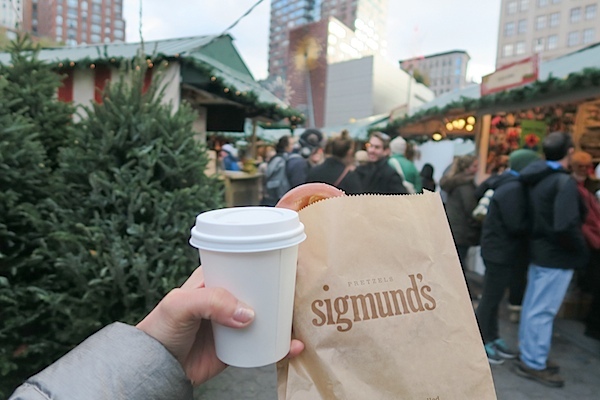 Since I was more hungry than thirsty, I first headed to the Sigmund’s booth where I saw a delicious-looking pretzel cart. You may recall from one of my previous posts that Martha Stewart once called the Sigmund’s pretzel the best. 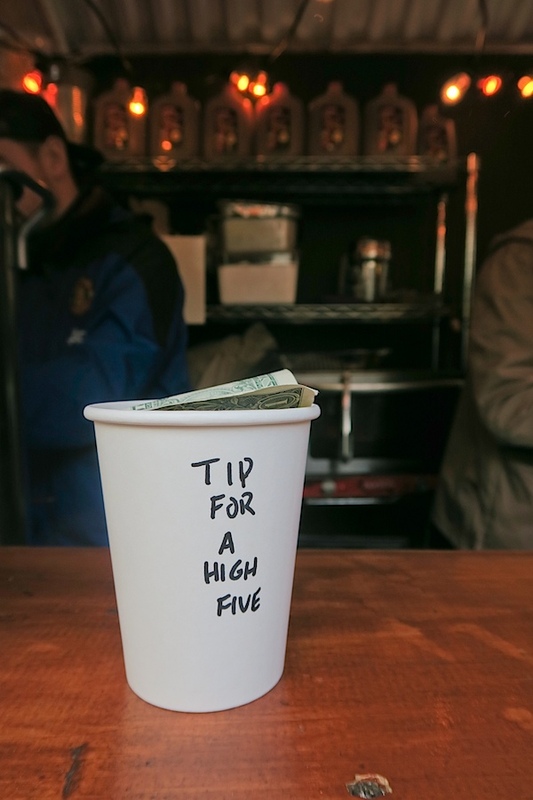 I like to be a little more generous with tips around the holiday season in general, but I also intrigued by this “Tip for a high five” tip cup at the pretzel booth. Sure enough, after dropping my tip, I received an enthusiastic high five. Woop! 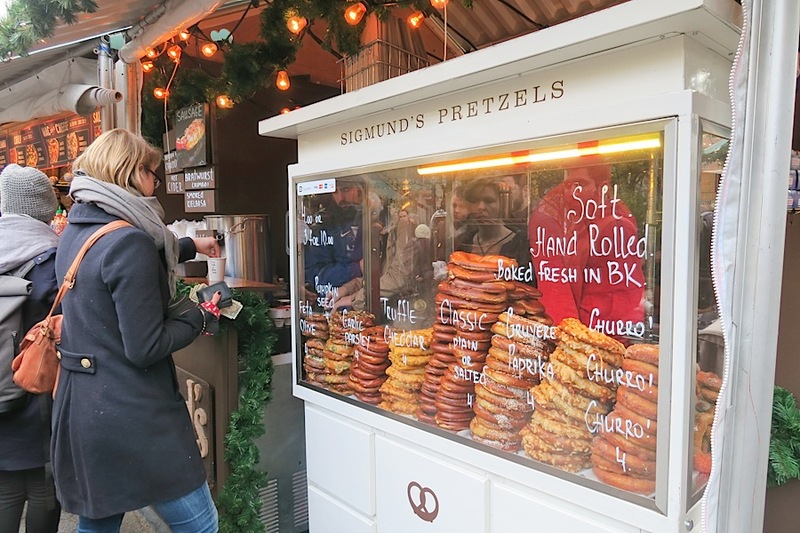 This booth had tons of pretzel flavors, but I went with a classic salted pretzel. A short wait later, and I was happy enjoying a hot pretzel with hot apple cider to drink. And since I wanted to make a lunch out of it, I went for something a little more substantial to follow. 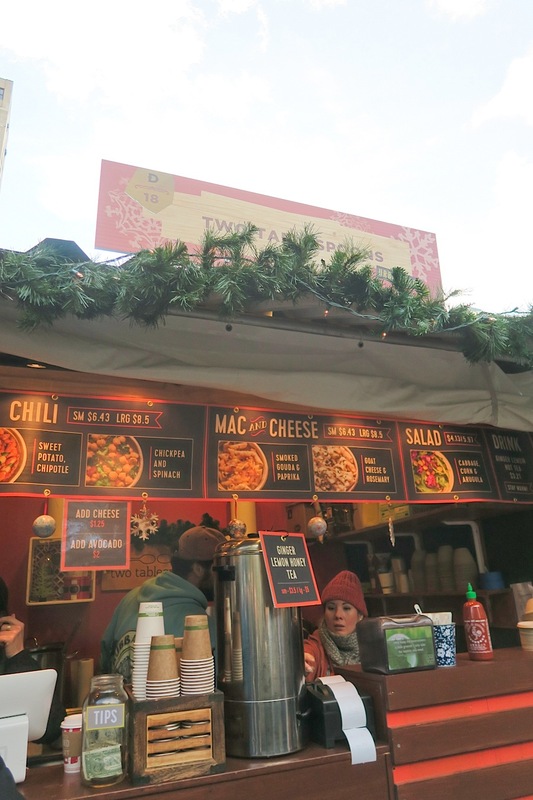 I visited the Two Tablespoons booth and then had the tough choice of mac and cheese or chili. All the food is vegetarian at this pop-up restaurant by the way. 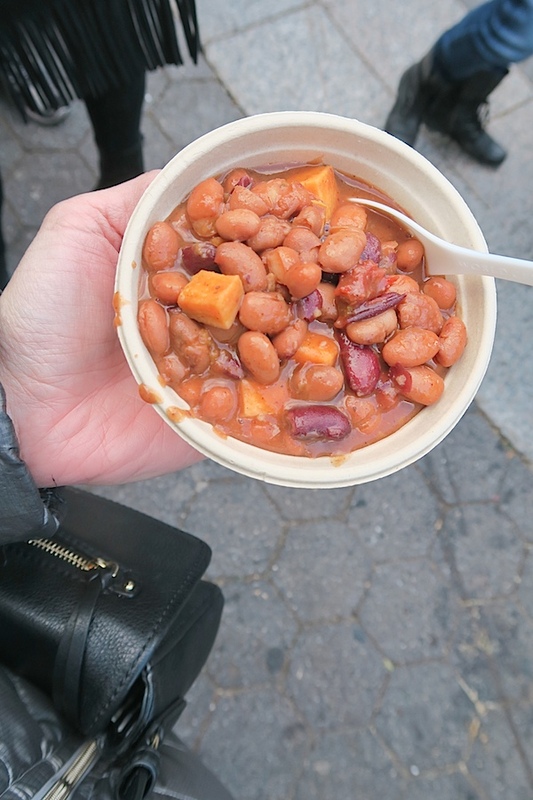 I opted for the sweet potato chipotle chili and happily ate this while I made my way out of the market and down the street in search of another hot beverage. A matcha latte at my fave spot, MatchaBar.